A few weeks ago I surprised myself by falling headlong into a crush. A deeply passionate affair, with lots of fire and gasps of pleasure. Ahem. I discovered duck eggs. In particular, I discovered fried duck eggs. I’ve long maintained a strong anti-egg stance. After several miserable experiences with boiled and fried eggs as a child, I have long held a belief that eggs were best suited to being baked into cakes. At a pinch, I’d eat scrambled eggs or an omelette, but you would never, ever catch me eating a boiled (soft or hard), poached or fried. So what changed? 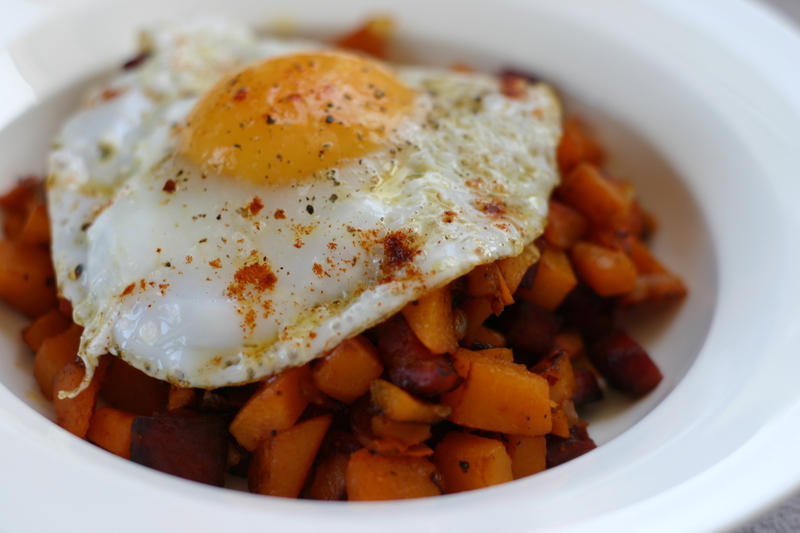 This butternut squash and chorizo hash is a ritzy adaptation of the original recipe I tried. I always have some chorizo knocking arounc the fridge and I had some butternut squash that needed to be used up, so I thought I’d combine the two with somewhat stellar results, if I do say so myself. Chopping the squash into small dice is a bit tedious, but just keep reminding yourself of how delicious the results will be! If you don’t have a microwave then you can par-boil the squash until softened before crisping up in the frying pan. The microwave does make faster work of it, though. Put diced squash in a microwave-proof dish with a tablespoon of water and cover. Microwave for 5 minutes until almost cooked. Meanwhile, put a large frying pan over a low heat and toss in the chorizo. Cook slowly to render out some of the fat, then turn up the heat and sizzle until crisp all over. Remove from the pan with a slotted spoon, leaving the paprika-scented oil behind. Add the chopped onion and the softened butternut squash to the frying pan and fry over medium heat until the onions are translucent, and turning a little bit golden and the squash is cooked all the way through. This shouldn’t take long–about 5-10 minutes. Scatter over the garlic and chorizo, stir through well. Cook for another couple of minutes until the garlic is fragrant and the chorizo has warmed up again, then check the seasoning. Add salt, pepper and paprika as necessary. Once it tastes awesome, divide the hash between two plates. Turn the heat to low and add the oil to the frying pan. Since I’m a n00b at fried eggs, I like to fry mine one at a time. If you’ve been doing this for years, go right ahead and do your own thing! Crack your duck egg into a ramekin and pour into the centre of the pan. Season and pop a lid over the egg. Cook for 2 minutes and then slide on top of the hash. Repeat with the other egg and sprinkle some paprika on top of the fried egg. A wonderful and interesting breakfast. Great stuff.